Good Deeds Day is a global annual tradition of good, calling everyone to come out together and give of themselves for the benefit of others and the planet. People can unite around good. Just imagine the impact! If every person does something to make a difference, and communities, organizations, and corporations give of their time and skill to help others, lives will be improved, and our world will be a better one. Celebrated since 2007 every year in March, Good Deeds Day has swept people from all cultures and backgrounds. Millions of people in 108 countries participated in Good Deed Day 2019 - making Good Deeds Day the largest and most far-reaching global day of good. In 2016, Good Deeds Day won the 2016 George W. Romney Affiliate Excellence Award, due to exhibiting outstanding excellence in leveraging, engaging and managing local changemakers, and illustrating how individuals are motivated to collectively create change to address community needs. In 2020 Good Deeds Day will mark its 14th year of expanding the circles of good, involving millions worldwide. It will be held on March 29, 2020 around the world, and on March 24, 2019 in Israel. Share your own good deed with the world and tag #GoodDeedsDay on Facebook, Twitter, Instagram, and YouTube. Each year in March, Good Deeds Day draws hundreds of thousands worldwide, from all walks of life, to do a good deeds for the benefit of others and the planet, each according to their heart's desire. On its 10th anniversary, Good Deeds Day continues to grow and expand, crossing all borders and cultures as a uniting force of good that sweeps millions of people in more than 70 countries worldwide. 930,000 people participated on Good Deeds Day 2015 in 61 countries worldwide, spreading the message that we can all do something for the benefit of others, each in their own unique way, and together make the world a better place for us all. 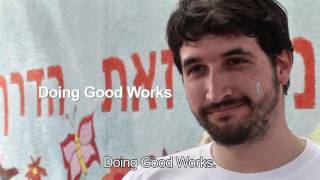 Tens of thousands joined Good Deeds Day 2014 to do a good deed for the benefit of others and the planet, engaging in thousands of dedicated projects across 50 countries worldwide and expanding the circles that create a critical mass of goodness in the world. On its seventh year, Good Deeds Day 2013 spread to more countries and received extensive media coverage for connecting people from all walks of life who want to see a better world. 2007 was the first year in which Good Deeds Day was held, initiated in Israel by Shari Arison to give opportunities to people worldwide to do a good deed.